1 Since the beginning of time, the ancient Romans worshipped hundreds of gods and goddesses. Many of those deities came from foreign lands that the Romans had conquered. As different faiths sprang up across the ever-expanding empire, they were more or less tolerated. Such open attitude, however, was not the case for Judaism and Christianity. Both religions pointedly refused to honor Roman gods and to idolize Roman emperors. As a result, the Jews and Christians endured centuries of hardship. One good example would be Emperor Nero. In 64 A.D., a big fire engulfed Rome and destroyed much of the city. Emperor Nero pinned the blame on the Christians. Through relentless persecution, he also allegedly killed two Christian apostles -- Saint John and Saint Peter. 2 At the onset of the 4th century, Constantine the Great (or Constantine I) ascended the throne. He held a different view toward Christianity and gave the religion a big break. Seven years after he seized power, in 313 A.D., he and Licinius (his brother-in-law and co-emperor in the east) issued the famous Edict of Milan. They declared that both the Eastern and Western Roman Empires would keep a neutral position on all faiths. Constantine the Great even commissioned the construction of several grand cathedrals. For the first time in ancient Rome, Christians could openly practice their religion without fear. 3 No doubt, Constantine the Great was the driving force behind the spread of Christianity. 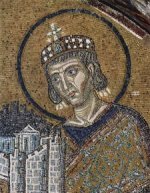 But who was Constantine the Great, and what were his other accomplishments? 4 Constantine the Great was born Flavius Valerius Constantius around 274 A.D. His father, Constantius, was an ambitious army officer. His mother, Helena, was probably the daughter of an innkeeper. When Constantine the Great was just a teenager, his father left him and Helena in order to marry Theodora. Theodora came from a very prominent family. Her stepfather -- Emperor Maximian -- was, in fact, the most powerful man in the entire Western Roman Empire. Through this new marriage, Constantius was able to make a huge leap in his career. His father-in-law gave him the title of Caesar (junior emperor) in 293 A.D.
5 As Constantius worked hard on proving himself in the Western Roman Empire, Constantine the Great did the same in the Eastern Roman Empire. The young boy joined the military and served with distinction.